I recently received an invitation to a yoga workshop billing itself as a “Power of Play Bootcamp”. Most of us, on the yoga mat as in life, don’t think much about the importance of play. We are often so focussed on our goals – whether it’s the next stage in our career, if we can make a headstand without falling over or just organising dinner for that evening – that play is simply not on the agenda. We all know that children play intuitively, without being told how to or why. Play is important to our development as human beings. So why does it tend to peter out when we reach adulthood? Perhaps we feel life is too serious a business to bother ourselves with such childish things. But what about yoga? The National Institute for Play defines play as something that’s done for its own sake. It’s voluntary, pleasurable, and offers a sense of engagement with whatever you are immersing yourself in. There doesn’t need to be any point to it beyond enjoying yourself and having fun: the act or experience of playing is more important than whatever the result, if even there is one. Play as an adult has many benefits: not only does it increase wellbeing and create positive moods, it can boost creativity and work efficiency. This is why, in the more creative and forward-thinking companies such as Google and Apple, you’ll often find play areas in their offices dedicated to air hockey, table tennis or Foosball. One of the best stress-busters around, more play means less stress. This, in turn, means less cortisol coursing through your veins, too much of which has been linked to a variety of mental and physical health issues from depression to heart disease and even cancer. So more play is definitely a good thing there. But how do we play in yoga? If you’ve ever watched a baby discover its feet, you’ll know what she means. Play is an integral part of a Scaravelli-influenced practice but, as the “Power of Play Bootcamp” invitation shows, it could helpful to any yogi, practising any form of yoga. As a taster, the bootcamp invite suggested taking downward dog and adjusting the stance. Move your hands towards the front of the mat and your feet towards the back, it said. Extend the stance. Then shorten the stance. How does it make you feel? And while I applaud the sentiment, reading through the invitation makes it sound less about play and about as appealing as, well, a bootcamp. In my Scaravelli-influenced yoga classes my teacher Caroline Reid routinely talks about “playing” within whichever pose we happen to be attempting. Often the shapes we make with our bodies are unrecognisable to those as demonstrated by Mr Iyengar in his book! And if you want to do it in a way that’s truly spontaneous, it’s harder than you imagine. Yes, we can all take a downward dog and adjust our hands or feet or perhaps the tilt of our pelvis. But even when Caroline had us crawling around a mat covered floor with the suggestion that we move into downward dog at any random point with our hands and feet positioned any which way, it was amazing to discover how difficult it was not to immediately readjust ourselves into what we felt was the “correct” pose. Clearly there’s comfort and security in the familiar. Subconciously we extend this to our yoga practice. The key is to practise mindfully, thinking about movements rather than going through them on autopilot. In the pose, make small adjustments, see how they feel. Consider the pose not as a destination but as an enjoyable journey instead. Playing in such a way helps create awareness of our pre-conditioned attitudes and habits – and it’s always good to challenge those, in yoga as in life! So if you are stuck in a rut with your yoga practice or with a particular pose, perhaps exploring the more subtle energetic aspects of a posture might open up new possibilities. 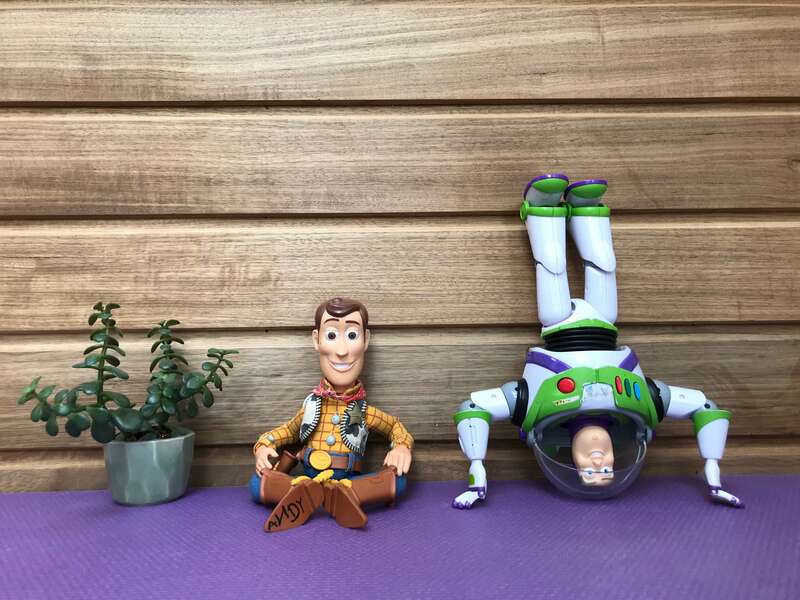 Just as problems at work sometimes require creative solutions arrived at through play, being creative – or “playing” – in your yoga practice might help shift whatever’s blocking you. As we experiment on in our Scaravelli-influenced classes, regardless of how we might look, we are often rewarded by a sudden easing in a shoulder or the slow realisation that, somehow, this playing has given us more freedom in our hips than we thought we had. So while I wholeheartedly endorse the concept of being creative in a yoga class and “playing” with poses, I remain to be convinced that bootcamps are the way forward. I love to play—have I mentioned the croquet set that my husband catches me using in the living room? Not quite the discipline of yoga, but still, the little things make my heart happy and keep it laughing. It’s so true – when did we start to get so self-conscious about playing together??! Sometimes it seems like “growing up” gets in the way of living an authentic life, right?! Thanks for the food for thought, Monika – loving your blog! Hi Debra! Well said and I think we are so fortunate in that we can enjoy our work in this way. I’m currently setting up a business and while it is a lot of hard work, it is fun and exciting too. When the company is big enough to get an office, I’m going to insist on space for a ping pong table! But you’re so right. Life shouldn’t be interspersed with play. Play should be integral to it.